Two principles inspire the project implementation: realize innovative solutions for users engagement and produce scientific and clinical evidence of the efficacy and quality of the system. WP2: Definition and consolidation of technical and functional requirements. 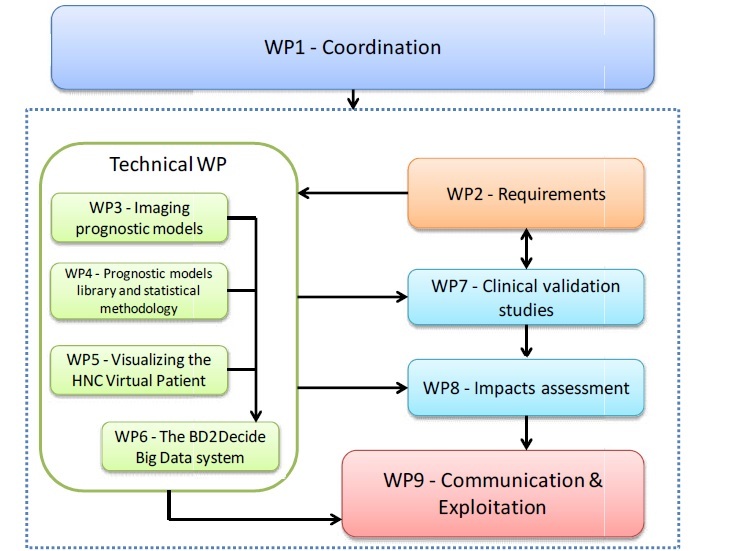 WP3: Development and integration of imaging and radiomic tools for non-invasive patient-specific tumor characterization. WP4: Creation of a HNC prognostic models library and of reasoning techniques for models association to patient's and tumor sub-types. Technology and impacts assessment, and consolidation of value proposition and market positioning. WP9: Demonstration and publication of scientific results and definition of partners exploitation and business plans. A strong Coordination in WP1 will supervise on the achievement of these targets.